The price you pay for data as part of your mobile phone plan is falling rapidly. The amount of data that you are using in your plan, is increasing just as fast. Mobile video is the key trend driving the increasing use of data. The phone companies are trying to encourage you to watch more video on your phone with entertainment options. What this means to the average person is: DO NOT BUY A PHONE UNDER CONTRACT. We recommend that you GET A SIM ONLY / PREPAID SIM with 28 or 30 day terms. Avoiding contracts means that you will get cheaper data as pricing falls. If you are buying a phone, buy it outright or using a leasing scheme. What is changing when it comes to data in phone plans ? Just last year, around the world, Cisco say we transacted 74% more data over mobile networks than in the previous 12 months. It is literally true to say that you may well have more data in your current phone plan this month, than was used by an entire phone network in the year 2000. At the turn of the last century, only about 10 GB of data would flow across the entire Vodafone, Optus or Telstra network. If you had a very early BlackBerry, one of the earliest data centric devices, you might have contributed to that tiny trickle. There are now dozens of phone plans in Australia which have more than 10 GB per month included ! Just last year, around the world, Cisco say we transacted 74% more data over mobile networks than in the previous 12 months. But, as you’ll have noticed, if you are on a SIM Only or prepaid plan, your phone bill isn’t rising at anything like the same rate. The amount you’re spending on your plan is consistetly about the same, even as the data allowance in the plan has increased. Mobile video, alone, is 55% of all the traffic which goes over the network. Mostly, at the moment, that 55% is made up from people watching YouTube. But the phone companies are trying to encourage us to watch video as much as possible on our phones. You might have seen the news from America in late 2016 when AT&T bought Time Warner. Optus is investing in the EPL – that’s the English premier League. Telstra, too, are offering sports as part of their mobile phone services. It’s a rush among the phone companies to see who can train their users fastest to enjoy entertainment (and therefore data) on their phones. In just 2 years, the amount of data you can get for a standard spend has increased 80 times. The price of the data plans we sell through our website has stayed about the same over the last 2 years. But the data inclusions have increased dramatically. Two years ago, a monthly spend of $30 would get you 200 MB of data per recharge window / calendar month and some voice minutes in a plan. Now, the same $30 will give you a plan with as much as 4GB from some of the smaller phone companies per recharge. Try and imagine that in more detail. In just 2 years, the amount of data you can get for a standard spend has increased 80 times. So, what does it mean to you ? It means, don’t buy a phone under contract. BYO plans (the alternative to contracts) now account for 45% or more of the Australian market. In a nutshell, the deflation in data pricing means that you should not buy in to a phone and SIM linked contract. BYO plans (both postpaid and prepaid) now account for 45% or more of the Australian market. It’s not hard to see why. Buying the phone yourself and adding a SIM when it can work out 25% cheaper. Ultimately, the number of data services that are available and the fact that data is now integral to your phone plan means you need to manage your data: Ordinary users are going to need apps and a more sophisticated view. Data usage is going to grow at more than 50% per year from here on in. You need an awareness of what ‘zero rated’ means and roughly what your usage is by service type so you can buy a plan which suits you. So, erm, what is ‘zero rated’ ? What does it mean ? Zero rated data is data that you get ‘free’ as part of your plan. If, for example, Optus (who have the best entertainment options on the market at the moment in our view) offer ‘zero rated’ streamed internet radio as part of their prepaid plans (and they do) you won’t be charged for the data you use streaming internet radio. It’s best shown with an example. Imagine you have a data plan with 4GB, like the one we considered earlier. And you listen to internet radio over an Optus prepaid connection for 24 hours a day, 7 days a week all month. If that’s all you do, you’ll finish the month with 4GB of data left on your plan. Zero rated content is not charged as part of your monthly plan. 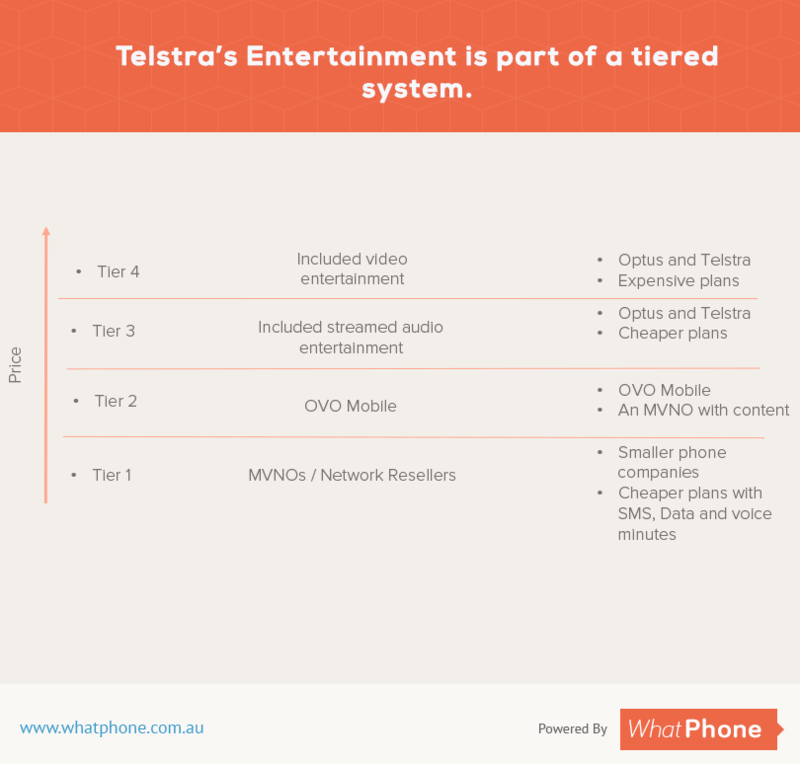 Bigger phone companies, like Optus, Vodafone and Telstra are offering phone plans which have entertainment services built in. Shop around these days and you will see more mobile phone plans with services like video and audio included. Most of them are ‘zero rated’. Optus and Telstra are both betting big on the trend with multi million dollar acquisition of content rights. According to Paul O’Sullivan (ec CEO, current chariman) from Optus, there could even be mergers between phone companies and telcos down here. Is it really so unimaginable that Telstra would merge with Foxtel ? Or Channel 9 and Vodafone ? The result is a tiered system of price / value for your phone plan. Smaller phone companies (a.k.a. MVNOs) are at the bottom of the pyramid. They tend to provide their users basic plans with voice minutes, SMS and data. Bigger phone companies, like Optus, Vodafone and Telstra are offering more expensive phone plans. They’re top of the pyramid. These plans have entertainment services built in. They’re worth paying more for, each month, if you like the content that’s included because the data from those content services is zero rated. Over time, you will see more phone companies selling content: OVO Mobile is a prime example. In our view, they offer the best of both worlds. If you love motorsports or gymnastics, they have included entertainment services. If you don’t, they still have some of the best data pricing in market. What’s causing these massive decreases in pricing for data in phone plans? First of all, competition is causing the decreases in data pricing that we’re seeing. Data has become the battle field. The data networks offered by the major 3 phone companies are all (largely) the same. People are realizing that unless they live in a far flung place, whether they have the SIM in their phone from Optus, Telstra or Vodafone doesn’t matter. Additionally, however, the phone companies are innovating around the subject of data. They find more ingenious ways every year of proving data to their customers. Take, for example, Boost Mobile who offer users extra data over the weekend, when their customers will be out and about and potentially away from wifi signals. Finally, as we’ve seen with their range of entertainment options, phone companies are giving it away free. Entertainment options often include ‘zero rated’ data. When you’re listening to streamed audio on an Optus prepaid – you won’t be charged for the data you use. If you watch Netflix on some Optus plans, the data is included in your SIM service fee. Similarly, if you watch Australian Gymnastics or Drag Racing on OVO Mobile, the data you use to watch that SVOD will not come out of your bundle. Ultimately, it’s cultural change – it’s your behaviour and my behaviour – which is driving this increase in the use of data. The rising graph simply represents the move of everything to the internet. It shows that we’ve stopped talking on the phone, now we message on the phone. As we’ve seen reported in the press, 25% of smartphones don’t make a single call per week. We’re using instant messaging applications to communicate. You don’t call for a Taxi, you open your data using Uber app. We ignore our friends at dinner to check Facebook and cross the road, risking our lives, engrossed by the screen of our phones. iOS (Apple) and Android Phones – How much data do I need ? Technology has gotten away from us when it comes to telecommunication services. The exponential increase in the use of data is just an example of a trend which is out of control, invisible to most and occurring in more places than most suspect. The truth is that the intersection of the technological advances is moving too fast to track. It’s going to cost us dearly. There is a great unanswered question after all this money has been spent on not one but three mobile phone networks, by Optus, Telstra and Vodafone : Why are you giving us parallel access to 3G, 4G and 5G. 5G will have (the perception of) unlimited bandwidth. Why do we need three infinitely expandable data pipes around the country ? Telco management and strategy is a land of insanity. It suffers from ever changing strategic directions internally. Optus are buying a TV company one day and dealing with 5G rollouts the next. It can be a panicky environment. Who can blame the phone companies for failing to see the big challenges they face? Ultimately, it’s the regulator which is letting us down, allowing phone companies to each build their phone networks. As the telco market bubbles and morphs in to something different every year and our culture follows, the regulator has missed the trick not once but twice. We should be building only one 5G network and providing it to all the phone companies so that they can compete on price, service, value adds and the other stuff we’re prepared to negotiate on. But we’re not. We’re building 3 and passing the cost on the unnecessary to customers in phone plans. And then the regulator has also allowed $billions more to be spent on the NBN! Another parallel network with infinite capacity! What’s more, 5G’s infinite bandwidth is likely to reduce the amount of money phone companies have to spend on acquiring spectrum licenses. The $billions they are spending on 5G networks could have been taken in taxes rather than provided to Nokia and Erikson. We are going to have 4 infinitely wide roadways and the government is going to make less money out of them.